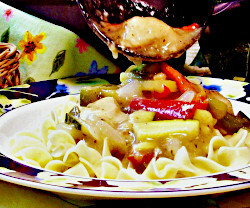 Boneless chicken in a Parmesan, mustard and lemon sauce with tender vegetables over pasta. 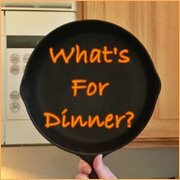 Serve with seasoned French bread for an easy and delicious family dinner in 30 minutes. From kitchen to table in 30 minutes. Turn oven on to 350 degrees. Spread margarine over bread and sprinkle lightly with Italian seasonings. Wrap in foil and place in oven. Cut chicken into cubes and brown in oil over medium heat. Fill a large saucepan with water and heat on high. Dice onion, zucchini, green pepper and red pepper, crush and mince garlic. Add to chicken and stir. Crush and mince garlic. Add chicken broth, Italian salad dressing, grated Parmesan cheese, lemon juice and Dijon mustard. Simmer over low heat. When water in large saucepan reaches boiling, add pasta and continue cooking over high heat. Stir occasionally. Mix water and cornstarch. Pour over vegetables. Season with pepper and oregano. Bring heat up to medium-high and cook until sauce is thickened. Check pasta for doneness by biting through a piece. If no white center appears, pasta is done. Drain and rinse. Serve pasta topped with chicken and vegetables along with warm bread.